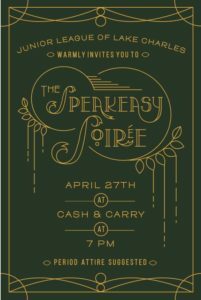 Click here to purchase your 2019 Speakeasy Soiree online tickets! Coming Soon. . . Click here to preview the 2019 Speakeasy Soiree Action Guide! Online Ticket Orders can be picked up at Will Call the evening of the event. 1920’s period attire is strongly encouraged!